Professional Mothering: "Building" a major triad. Music has lots of patterns. Patterns are an idea that repeats itself again and again. Learning to recognize and recreate patterns on the piano is going to help you create music in a beautiful, fun way. One of the first patterns we see when we look at the piano are the black and white keys. First three black, then two black keys, repeated all across the keyboard. A chord is typically composed of three or four notes. A major triad is one of the most frequently used chords, so we’re going to dive right in and learn the about “building blocks” for the major triad first. A triad has three notes in it, just as a tricycle has three wheels, a triceratops has three horns, and a triangle has three sides. Triads are also made of thirds. We are going to use blocks to create the same patterns that are in a chord. First, using blocks, we begin with the foundation. With your blocks, choose a color to be the base, or root for all of your chords, and set this block aside. I used green. Next we need to build a major third A major third consists of three blocks you won’t play, and a block on top. Choose a different color for the top block of a major third, because we’ll be coming back to it. I used red. Finally we need to build a minor third. A minor third is one block smaller than a major third, made with three blocks total. Choose a third color for your minor thirds. I used blue. Now we stack the pieces. The base goes on the bottom, then, because we are building a major triad, we place the major third on the base first. Then add the minor third on top. This is the pattern you will use for building all major triads on the piano. Now comes the fun part. 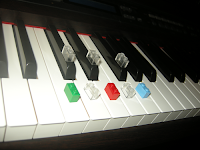 Take your blocks to the piano and put your base note on the letter “C”. One by one, take the blocks off and put them on the next note, left to right. Do this for black and white notes. Your played notes should be “E” for the major third, and “G” for the minor third. So the notes you play for a “C” chord are C, E, and G. That’s all there is to it! The next step: Try building a chord on F. You should come up with F, A, and C. Build it again on G, and you end up with the notes G, B, and D. These are the primary chords for the key of C, and are the only major triads that have all white notes. Becoming familiar with these three triads is a great place to start. The more ways you can generate quality inbound links to your site, the better. Here are some tips on how to do it Marketing1on1 is the best link building agency.